b. 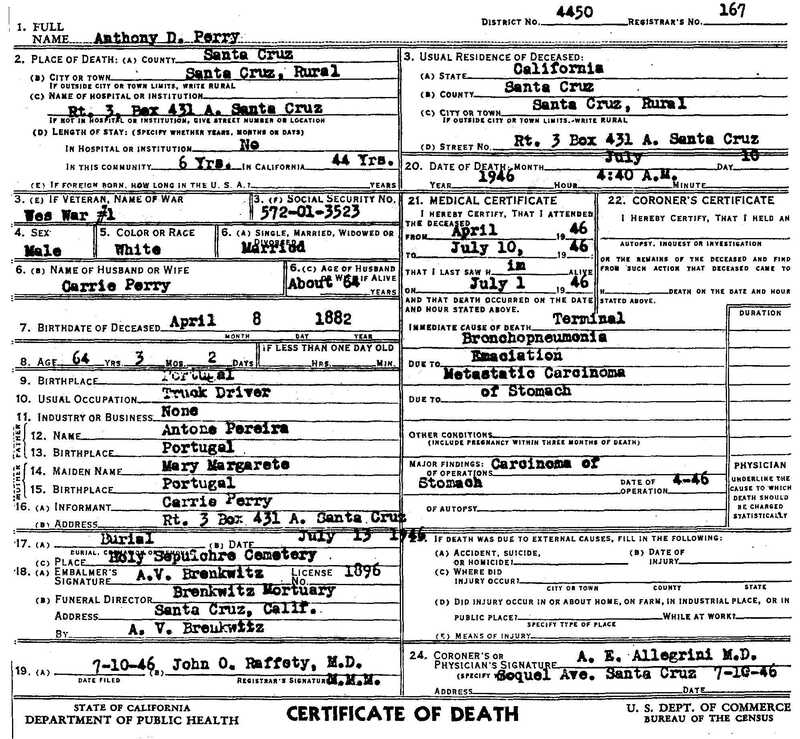 31 Jan 1859, Pedro Miguel, Faial, Azores, d. 13 Mar 1947, Richmond, Contra Costa Co. CA, m. Maria Margarida da Silva, 30 May 1881, immigrated 24 Nov 1884. 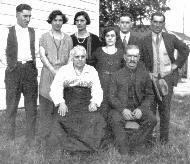 Maria & Antonio Pereira Cardozo III Children, Anthony Dexter, Joseph Harvey, Maria Dorothy, Margaret Etta, Anna Mae, Rita, Frank Daniel. 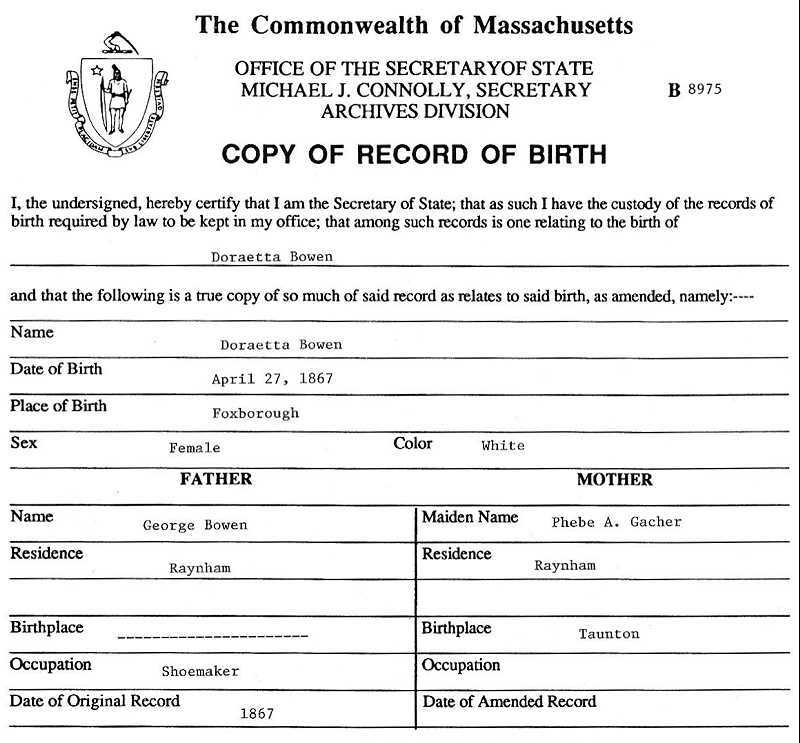 26 Sep 2009, Dora Etta Bowen parents, George W. Bowen and Phebe A. Tucker, not Gacher as per Doraetta's birth record states. b. 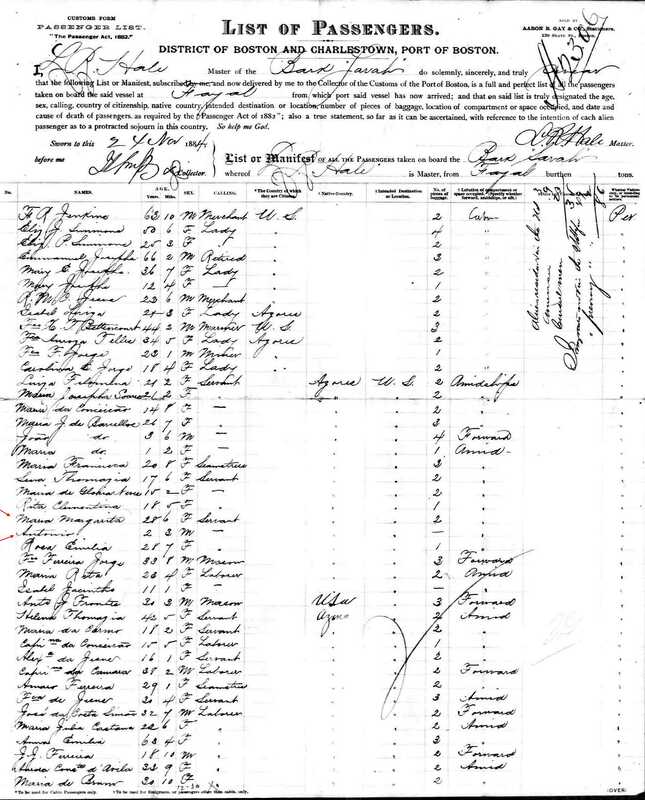 6 Jun 1889, Taunton, Bristol Co. MA, m. Otis P. Christian, 1907 Point Richmond, Contra Costa Co. CA. Maria Dorothy Perry, who made the Guinness Book of World Record 2003, d. 20 Apr 2003 at 113, shy of 114 by two months......she was 31 when women got the right to vote, and 52 when Pearl Harbor was bombed. Antonio & Maria Pereira Cardozo III, had 10 children of which 4 died, a baby boy at birth in 1884, Maria 1886, Manuel 1890 as an infant and Rita in 1899, on a return trip to San Miguel, Fayal, Azores. The child on the left Maria? Could of been Maria if she lived to be 2 or 3, dying shortly after this picture. 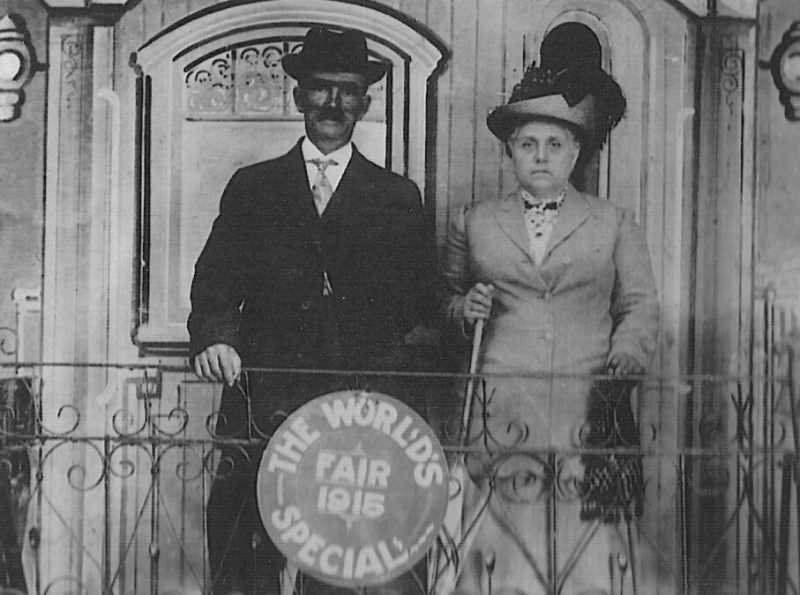 Maria Dorothy on the right was born 6 Jun 1889, Taunton, MA. What is puzzling, why wasn't Joseph b. 1887 pictured? Or since a family manuscript mentions baby's Maria and Manuel died as infants...the child on the left may well be Joseph in 1890, aged 2 or 3. Anthony Dexter pictured above is my great grandfather. I received a copy of this via e-mail from a descendant of Frank Daniel Perry. 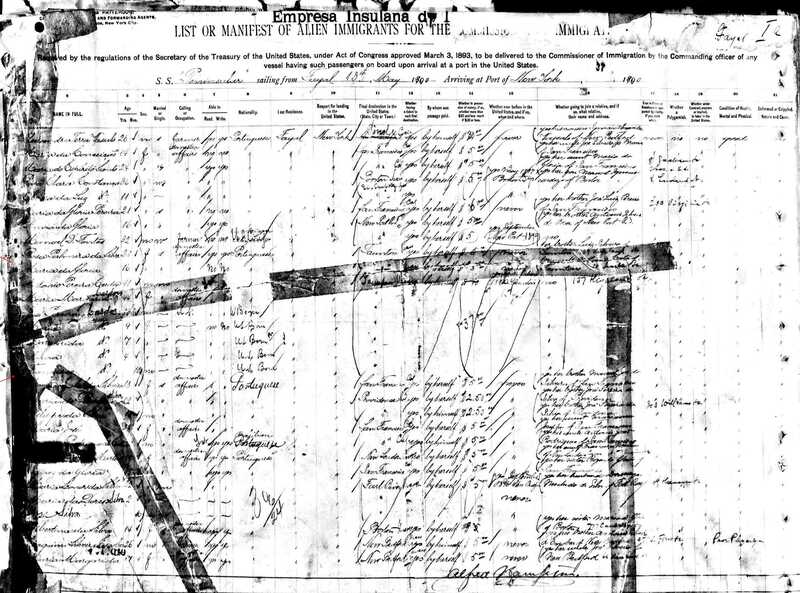 How a man left his native country to find a better life for his wife and children, a sacrifice not some people would make today, move to another state or city for their family let alone another country……my utmost respect for my Great Great Grandfather I share this with others……. In the 1870's, direct shipping began between Boston and Horta, Faial which was an impetus for increased immigration to the United States. In 1890's, the U.S. Consul moved from Horta to Ponta Delgada which is on the most populated island in the archipelago, Sao Miguel. This brought direct shipping to Sao Miguel and further increased immigration to the United States. In 1910, the Portuguese monarchy fell, and an anticlerical government was instituted which caused conservative Catholics to leave Portuguese possessions and relocate. Many came to the Azores and to United States. 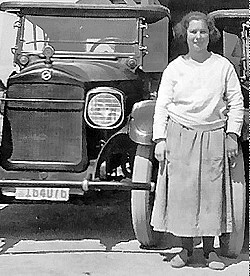 More Azorean immigration came from young men fleeing mandatory military service during World War I. Jobs were available in New England because of massive industrialization. This attracted Azoreans because of their lack of employment. The name Cardozo has been identified as a Sephardic (Jewish) name by the Holy Office of the Catholic Church of Spain. www.sephardim.com/ Portuguese, Galician, and Spanish: habitational name from any of numerous places with this name, denoting a place with an abundance of cardoons. The cardoon (Cynara cardunculus), also called the artichoke thistle, cardone, cardoni, carduni or cardi, is a thistle-like plant which is member of the Aster family, Asteraceae; (or archaic: Daisy family, Compositae). It is a naturally occurring variant of the same species as the Globe artichoke, and has many cultivated varieties. It is native to the Mediterranean, where it was domesticated in ancient times. Portuguese, Galician, and Jewish (Sephardic): ographic name from Portuguese pereira ‘pear tree’, or a habitational name from a place named with this word in Portugal and Galicia. The surname is also common in western India, having been taken there by Portuguese colonists. Surnames related by marriage/descendants of Antonio Pereira Cardozo I & Mariana Francisca de Ascencao, Abrao, Barstad, Brown, Bowen, Burton, Celis, Christian, Corey, Crocker, Cyr, da Jacinthe, da Silva,Davis, de Conceicao, de Faria, Enzenauer, Felica, Galindo, Geigoldt, Jeronimo, Joaquina, Logue, Luis, Luiz, Margarida, McMullen, Mercer, Montogomery, Reynolds, Rinna, Rita, Rose, Rottiger, Parks, Pereira, Salberg, Smith, Sowers, Swensen, Turner, Wilkins.